In “The Power of Now“, Eckhart Tolle discusses how the present moment is all there is. And how, fundamentally, time is an illusion. The past and the present exist only through our thought happening in the present moment. What is the present moment, the now? It’s often hard to see. Let’s say you’re sitting at a table having a conversation with your friend, but as your friend is talking you’re gazing off into the distance thinking of something unrelated. Sure, your present moment is just that, but in a sense it is completely distracted by thought. Instead of paying full attention and being fully mindful of your friend talking, you’re mind is adrift elsewhere, most likely unaware of it. As soon as you become aware that you’re drifting off, that is mindfulness, bringing you to the present moment – observing your thoughts as they arise out of consciousness. It gives you a point to focus on, a reference point – the breath for example – so that when your mind is distracted, you actually notice it. 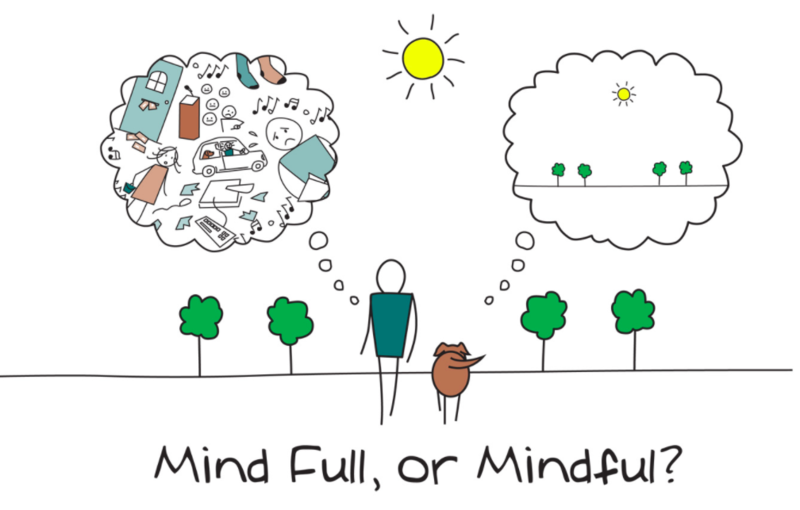 See my post on Mindfulness here. With practice, you naturally become more mindful of the moment, more present, more in the now. You truly begin to see thoughts as exactly what they are, simply thoughts, nothing else. So why is being in the now important? Why does it matter? Well, that is all there is. Like the Stoics came to conclude 2,000 years ago, all there is to being is the now. Studies also show that being in the now is also the place with the highest wellbeing (Source). A wandering mind is not a happy mind. So when one says that most people spend their entire lives lost in thought, it is true. A thought is just a thought. It is so obvious that most people don’t know it. But with mindfulness practice, it becomes obvious. And when you’re angry, sad, stressed, or anxious, you can stop, become present, and recognize it is simply a temporary sensation (or thought) that will pass, and not react to it. Or at the very least, if you do react to it, know that you’re reacting to it and ensure you’re mindful of your reaction. If thoughts get out of control, they cause unnecessary emotions and reactions that cause unnecessary suffering. It happens all the time to most people, unnecessarily. You can become the observer of thoughts rather than simply laying victim to them which causes unnecessary suffering. This is the idea behind meditation – simply observing thoughts as they arise out of consciousness, seeing them for exactly what they are, thoughts. I’d highly recommend reading “The Power of Now” or listening to the audiobook, it is useful to truly becoming a more aware, useful, and joyous person.